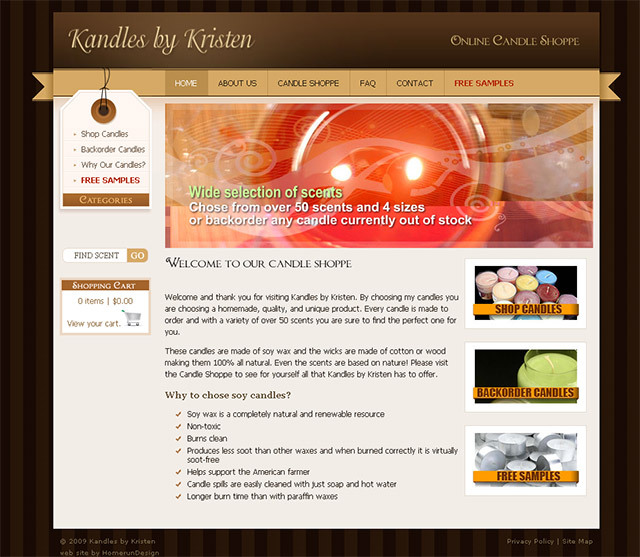 KandlesByKristen is a small online shop selling homemade soy candles. Client requested an e-commerce solution to sell heer homemade soy candles. Foxycart has been chosen for a shopping cart and checkout solution. Site was required to accept credit and debit cards – PayPal Website Payment Pro has been chosen for the payment gateway. Although the inventory was fairly small (50 items), the site has been developed with extension in mind. Therefore, everything is powered by PHP and MySQL database. The web site layout is a modified pre-built template, with integrated Flash banner and some jQuery for added effects and enhanced user experience. All articles were created to give users all information they need as well as to give the search engines optimal keyword density. Beautiful! The site looks great and I could not be happier with the result.